The kids are back in school and I am one happy camper. (But don’t tell them this). As much as I love the kids being home and all of Summer’s fun-filled moments, I am now looking forward to getting back into some sort of routine. Especially the routine of doing what I absolutely love – and that is writing about all the delicious gluten-free and plant-based dishes that have made the voyage across our dining room table and into our much appreciated tummies. This particular post is well overdue. Back in June, I had the pleasure of attending Ottawa’s 5th Annual Veg Fest (and its 1st Annual Yoga Fest) with my extremely veg-curious sister. I absolutely love hanging out with this girl! She nearly always makes me laugh – not when we were kids, though 😉 – and she is so enthusiastic about trying new things. We were super excited about our Veg Fest weekend. This event had an excellent line up of speakers including a showing of the 2011 documentary film “Forks Over Knives”. There was one lecture that particularly sparked our interest. It was a lecture by Canada’s own Laurie Sadowski. After grabbing a couple of Simply Raw’s black bean wraps and a bottle of Flexi Lexi’s green lemonade, we made our way into St. Paul’s University Amphitheater for an extremely informative lecture on “Gluten-Free Vegan Baking”. I immediately liked Laurie, otherwise known as “the allergy-free cook”, from the moment she told us that she was in love with her Kitchen Aid stand mixer. Naturally, I hung on everything this girl had to say. Let’s just say that Laurie is a wealth of information and, quite frankly, a walking encyclopedia on gluten-free flours. I was quick to buy Laurie’s cookbooks shortly after her presentation. It’s no wonder her books were flying off her display table! Laurie uses nutritionally superior flours in all her recipes such as, millet, quinoa, sorghum, and teff flours. These flours contain more fiber and protein than rice flour – a flour which is prevalent in so many commercial blends. My sister was loving her role as photographer this particular fine day. Here, I am standing all giddy-like with Natasha Kyssa (you may recall my raw food cleanse posts) and Flexi Lexi (we loved her green lemonade!). Both my sister and I are looking forward to next year’s Veg Fest. As far as I know, the date has not been released, but we have it “penciled in” from mid to late June. We are also looking forward to Laurie Sadowski’s new cookbook, “The Allergy-Free Cook Bakes Pies and Desserts” which is expected to be released later this year. I will end this post with a dessert that I made last month. The recipe is from “The Allergy-Free Cook Bakes Cakes and Cookies”. I made it as a bundt cake and it turned out perfectly delicious. Let’s be honest – it’s addictive. Seriously. Try stopping at one piece. (My daughters and I are guilty of polishing off half of this cake, within minutes, while standing in the kitchen watching it cool). Thankfully, I remembered to take a photo before we dug in. Preheat oven to 375 degrees F. Lightly oil bundt pan. Put the flours, baking powder, lemon zest, xanthan gum and salt in a medium bowl and stir with a dry whisk until combined. Using a stand mixer or hand mixer, beat the sugar and coconut oil on medium speed until creamy and well combined. Add 1/4 cup of the coconut milk, the vanilla extract, and vinegar. Beat until combined. With your mixer on low-speed, alternately add the flour mixture (in 3 additions) and the remaining coconut milk (in 2 additions). Beat well after each addition. Turn off the mixer and stir in the blueberries using a baking spoon. Scrape the batter into your prepared pan using a rubber spatula. Smooth the top with the spatula. Bake in the center of your oven for 40 to 55 minutes*, until golden brown. * If using fresh blueberries, check your cake with a toothpick after 40 minutes. Frozen and very juicy berries will require a longer baking time. This entry was posted in Desserts and Snacks and tagged bundt cake, cake, desserts, food, gluten-free, Laurie Sadowski, recipes, Veg Fest 2013, vegan on September 7, 2013 by uberdish. I felt like Superwoman this weekend because I got so much accomplished. On Saturday morning, I was in the mood for a change so I moved some furniture around in my living room. Gosh, that feels good! I then cleaned the house like crazy from top to bottom including the dreaded task of switching the summer clothes over to winter clothes in all our dresser drawers and closets. That also meant filling 2 large garbage bags for our local charity of clothing that no longer fits. You have no idea how much I despise this task of cleaning out closets and drawers! Our Hub is going to love me for it, though. To treat my girls and myself to a job well done, I decided I would make my apple pie and have it for dinner! (Well, I did make a cauliflower and leek soup in which we ate a small bowl first). The pie was delicious! My girls had 2 big pieces and thought I was….. THE. BEST. MOM. EVER. Made from quinoa flour, rice flour and arrowroot starch, this crust is crumbly, light and gluten-free. I got the recipe from a book I recently borrowed from our library, “Quinoa Cuisine” by Jessica Harlan and Kelley Sparwasser. I love to bake, but I have never considered myself a baker. Probably because I’m not a huge sweets eater. I really prefer savory dishes. Also, baking is not as forgiving if one makes small mistakes. I was proud of myself today, as this crust was perfect for the not so experienced baker. The original recipe calls for 1 cup of butter. Use your favourite vegan butter. I used Earth Balance. I baked the empty pie shell for about 15 minutes, as per recipe instructions. However, I baked the pie shell at 375 degrees Fahrenheit, not 400 degrees. (I always hesitate to cook or bake at such a high temperature!). My pie shell looked wonderful. After the pre-baking, reduce your oven temperature to 350 degrees F for the baking of your filled pie. I substituted a flax meal gel for the eggs and cashew cream for the sour cream or heavy cream. I made the cashew cream in my food processor with a cup of soaked cashews, lemon juice and coconut sugar. 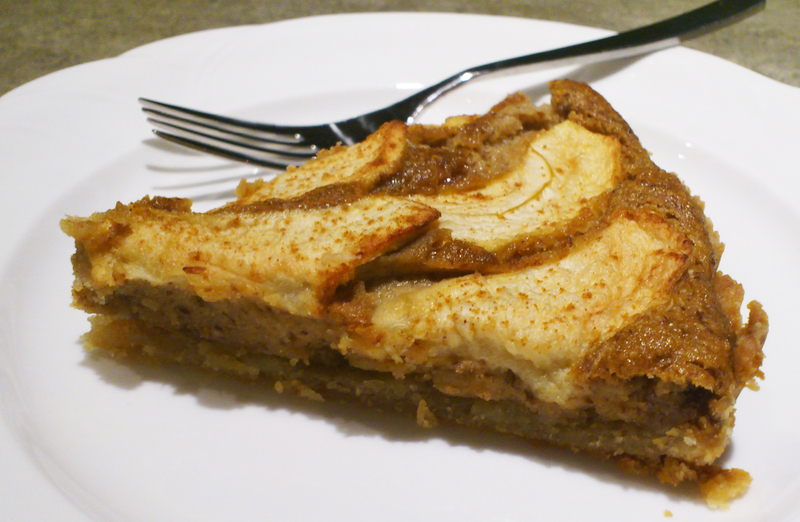 The center of this pie was creamy and sweet – caramel-like because of the coconut sugar. Now, who doesn’t like caramel?! Mix together in a separate bowl with a fork. Let sit while you prepare remaining ingredients. Mix sliced apples with lemon juice to prevent browning. Pour mixture from food processor into pre-baked pie shell. Place apples in the filling allowing for some overlap. (My daughter did this part for me). Bake pie at 350 degrees Fahrenheit for 25-30 minutes. Let stand for 10 minutes before slicing (if you can wait that long!). 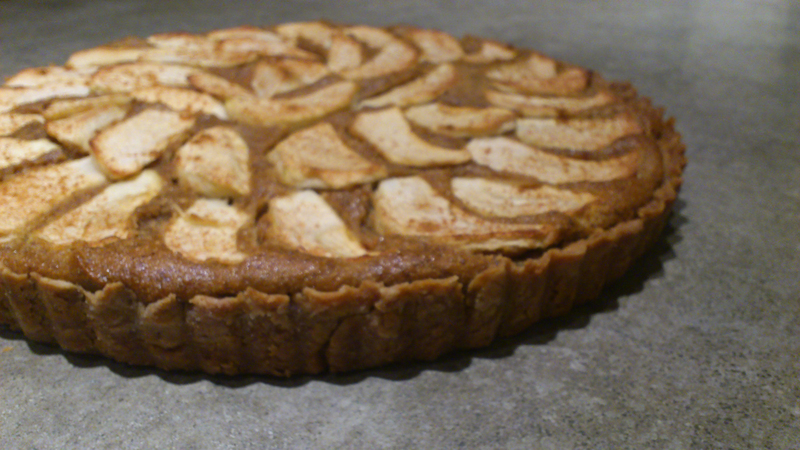 This entry was posted in Desserts and Snacks and tagged apple pie, cashew cream, desserts, flax meal gel, food, gluten-free, recipes, vegan on November 5, 2012 by uberdish. As I write this, I am trying very hard to ignore my scary kitchen! The table that I wiped 3 times still feels sticky and I spy pumpkin guts on the ceramic floor. My cat is feverishly playing with an abandoned pumpkin seed and I see a drool of chocolate on the kitchen cupboard. The sink is overflowing with dishes, the dishwasher is full to the max, and I don’t have a clean tea towel in the house! 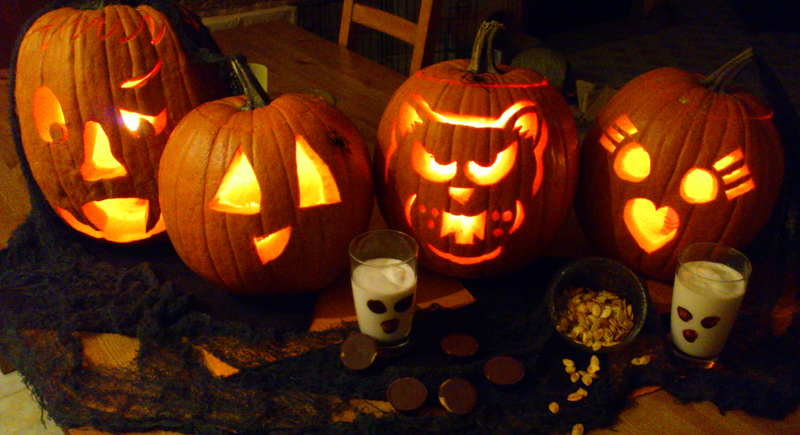 HAVE A SAFE AND HAPPY HALLOWE’EN!! 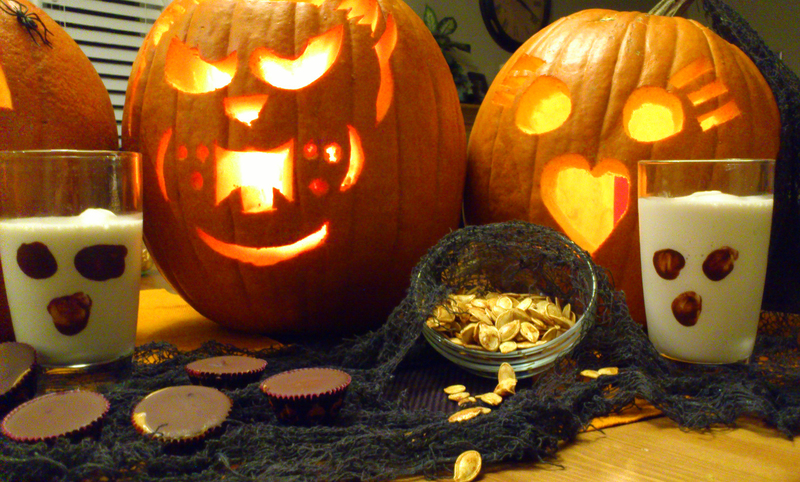 This entry was posted in Desserts and Snacks and tagged candy, chocolate, family, food, Hallowe'en, pumpkin, pumpkin seeds, sunbutter on October 31, 2012 by uberdish.